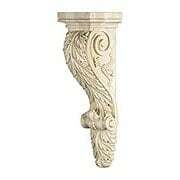 The Victorian Foliage Motif Corbel features a scroll design with leaf pattern. This decorative hand-carved wood bracket is available in four sizes. See chart below for the dimensions of each size. This bracket comes in cherry, oak and hard maple woods. This unfinished corbel is ready for paint or stain and comes with pre-attached keyhole hangers for easy installation. 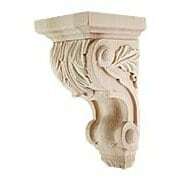 The Victorian Leaf Pattern Corbel features a scroll design with leaf pattern. This decorative hand-carved wood bracket is available in four sizes. See chart below for the dimensions of each size. This bracket comes in cherry, oak and hard maple woods. This unfinished corbel is ready for paint or stain and comes with pre-attached keyhole hangers for easy installation. Our Tall Leaf-Pattern Maple Corbel adds elegant flair to your decor. This intricate accent features a Victorian scroll design accompanied by a lavish leaf pattern. Ready for stain or paint, it comes in five size options - see chart below for the dimensions of each size. Left unfinished, it is ready for paint or stain and comes with preattached keyhole hangers for easy installation. 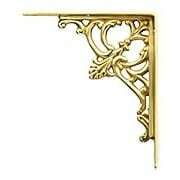 Ideal for use as shelf brackets, supports for a counter or fireplace overhang, or even bookends. Our Leaf-Pattern Maple Corbel adds elegant flair to your decor. This intricate accent features a Victorian scroll design accompanied by a lavish leaf pattern. Ready for stain or paint, it comes in five size options - see chart below for the dimensions of each size. Left unfinished, it is ready for paint or stain and comes with preattached keyhole hangers for easy installation. Ideal for use as shelf brackets, supports for a counter or fireplace overhang, or even bookends. 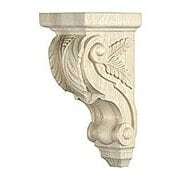 Our Leaf-Pattern Maple Corbel adds elegant flair to your decor. This intricate accent features a Victorian scroll design accompanied by a lavish leaf pattern. Ready for stain or paint, it comes in two size options - see chart below for the dimensions of each size. Left unfinished, it is ready for paint or stain and comes with preattached keyhole hangers for easy installation. 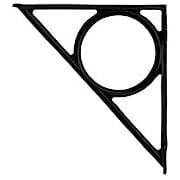 Ideal for use as shelf brackets, supports for a counter or fireplace overhang, or even bookends. 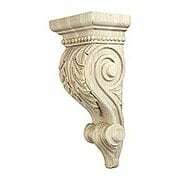 The Victorian Scroll Design Corbel features a scroll design with leaf pattern. 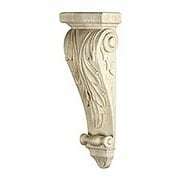 This decorative hand-carved wood bracket is available in five sizes. See chart below for the dimensions of each size. This bracket comes in cherry, oak and hard maple woods. 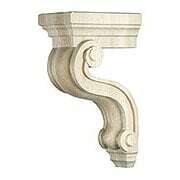 This unfinished corbel is ready for paint or stain and comes with pre-attached keyhole hangers for easy installation. 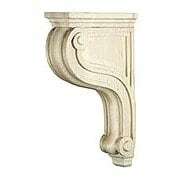 The Victorian Scroll Design Corbel features a scroll design with leaf pattern. This decorative hand-carved wood bracket is available in three sizes. See chart below for the dimensions of each size. This bracket comes in cherry, oak and hard maple woods. 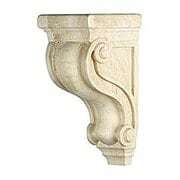 This unfinished corbel is ready for paint or stain and comes with pre-attached keyhole hangers for easy installation. 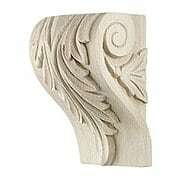 The Victorian Leafy Pattern Corbel features a scroll design with leaf pattern. This decorative hand-carved wood bracket is available in four sizes. See chart below for the dimensions of each size. This bracket comes in cherry, oak and hard maple woods. This unfinished corbel is ready for paint or stain and comes with pre-attached keyhole hangers for easy installation. 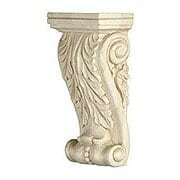 The Victorian Foliage Pattern Corbel features a scroll design with leaf pattern. This decorative hand-carved wood bracket is available in four sizes. See chart below for the dimensions of each size. This bracket comes in cherry, oak and hard maple woods. This unfinished corbel is ready for paint or stain and comes with pre-attached keyhole hangers for easy installation. 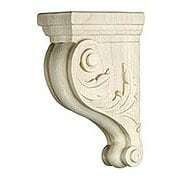 The Victorian Leaf Pattern Corbel features a scroll design with leaf pattern. This decorative hand-carved wood bracket is available in three sizes. See chart below for the dimensions of each size. This bracket comes in cherry, oak and hard maple woods. 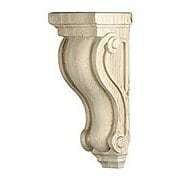 This unfinished corbel is ready for paint or stain and comes with pre-attached keyhole hangers for easy installation. 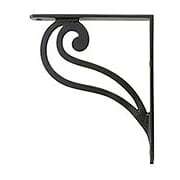 Scroll Design Iron Shelf Bracket - 7 1/8" x 6 1/8"
With its single, oversized scroll, this simple shelf bracket makes a bold, graphic statement. Medium sized, it's useful for shelving in any room. Crafted from heavy duty cast iron and finished with a durable, black powder coat. 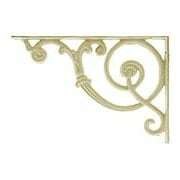 Antique White Scroll Shelf Bracket - 8 1/8" x 12"
Ornate Brass Shelf Bracket - 5 3/4" X 6 1/4"
Stylish and functional describes this ornate fleur-de-lis design. The cast-brass construction not only creates eye-catching detail, but promises long-lasting wear. With a polished finish to preserve the finish, it’s an elegant addition to any room. 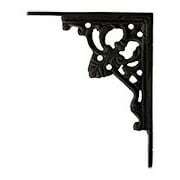 Cast Iron Fleur De Lis Shelf Bracket - 5 3/16" x 4 1/4"
Decorative fleur de lis shelf bracket. 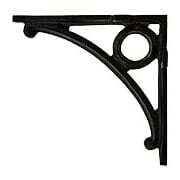 These cast iron brackets are available in three finishes. 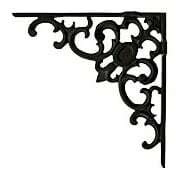 Ornate Fleur-De-Lis Shelf Bracket In Matte Black - 9 3/8" x 9 3/8"
The Ornate Fleur-de-Lis Shelf Backet (9 3/8-Inch X 9 3/8-Inch) adds Victorian style to your decor. 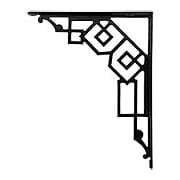 Made of sturdy cast-iron, it features a central Fleur-de-Lis surounded by decotrative scroll work, a make matte-black finish, and rust-resistant powder coating. 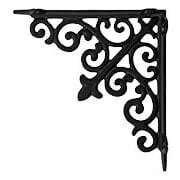 Decorative Scroll Shelf Bracket in Matte Black - 7 7/8" x 7 7/8"
This Classical Victorian bracket has a simple Fleur De Lis pattern bracketed by intricate scroll work giving a marvelous look to your shelves. Made from a heavy cast iron in a matte black finish.